Enjoy South Padre Island Hotel's Access to BeachWhether you're searching for accommodations that put island businesses at your disposal or the perfect starting point for an unforgettable vacation, look no further than the Holiday Inn Express Hotel & Suites South Padre Island. 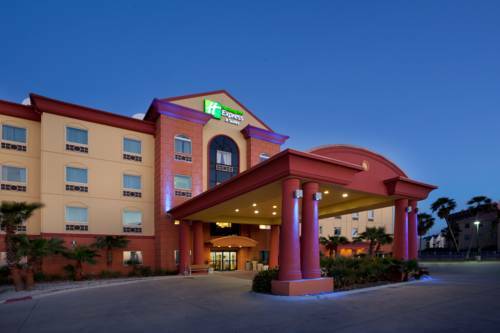 From this hotel, you can access the island's top corporations and take advantage of the beach and outdoor activities that South Padre Island offers.This hotel's business guests are sure to have a productive stay in South Padre Island thanks to the hotel's location. Stroll on the beach to clear your head before events at the island's oceanfront convention center. For more convenience and efficiency, you can book the hotel's meeting space, suitable for meetings and events of up to 125 guests.Vacationers have just a three-minute walk to the beach and enjoy the array of adventures available near the hotel's site on South Padre Island, Texas. Both Sea Turtle, Inc and the Birding and Nature Center are adjacent to the hotel. After exploring them, saddle up and experience a beach sunset via horseback at the Island Equestrian Center. "Stay Smart" at this hotel's facility on South Padre Island, Texas, where you can take advantage of a free, hot Express Start Breakfast Bar each day. Work out in the Fitness Center, and then fire up a barbecue grill by the outdoor pool for dinner in a convivial atmosphere. Free hotel-wide Wi-Fi access is provided. We hope to see you soon! Las Palmas: Conference Room Las Palmas is located on 1st Floor. It sit from 80 to 100 guest. Square and Round Tables are available. The Director of Sales will help you with any catering needs. Projector and Projector Screen are also available.